Storms producing wind and hail are common in the region, routinely damaging shingles or other roofing materials. Getting roof repairs completed as soon as possible will minimize any water damage to the home's interior, saving both aggravation and money. Industry experts recommend calling a roofing professional immediately after a storm to evaluate damage and connect with insurance providers. Having a complete estimate from a roofing contractor, listing all damages, available for insurance adjusters speeds up the repair process. Modern roofing systems are actually quite complex, and roofing contractors suggest homeowners do not try to complete repairs on their own, as quick patches often have to be removed before proper repairs can be completed. The contractor will remove all damaged materials and properly repair the roof, using materials that match existing roof coverings as closely as possible. On newer roofs, matching shingles is generally fairly easy as the existing materials don't yet show signs of weathering. On older roofs, the material colors are harder to match, as weathering has occurred, but professionals can still match materials closely. In either case, the roof is returned to a weather-tight status, protecting the home interior from damage. At times, repairing a damaged roof is not practical. If too much of the roof is damaged, the roof should be completely replaced. That often occurs after a major hail storm, where the entire surface is too seriously damaged to leave in place. With this kind of damage, the help of a roofing professional is especially important as some insurance adjusters may try to settle claims for a percentage of the replacement cost or specify replacement materials of a lesser quality than the existing products. A good contractor works to ensure clients are treated fairly. 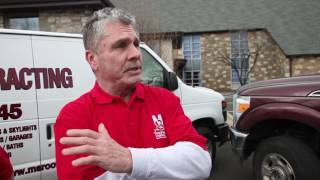 Completing storm damage repairs should not be a burden on homeowners, and working with a quality contractor often reduces the pressure. The documentation of damage provided by a qualified roofing specialist makes it quite difficult for insurance companies to challenge recommended repairs, and contractors know what documentation insurance companies want for their files. Homeowners, as a rule, simply do not have the experience to achieve the same results a contractor can obtain. During a major storm, other damage to a home's exterior may occur, and top contractors help homeowners to spot that type of damage. Gutter systems often suffer during major storms, and to keep water properly draining from the home's foundation, they must be repaired properly. Siding may also be damaged, and homeowners should have the contractor examine all siding for damage. Even if it is still functional, damaged siding is unsightly and reduces the home's value. Windows may also suffer damage from hail and should be carefully examined for any damage, but especially damage that actually affects window operation. 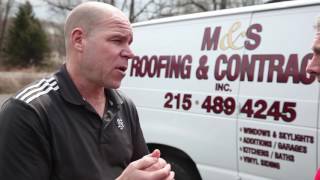 Always deal with an experienced roofing professional when roof repairs are needed. The knowledge they possess is crucial to handling the many issues seen on today's roofs, especially those with complex angles, peaks and valleys. Even if serious storm damage is not suspected, all roofs should be inspected at least once per year by a roofer to spot developing problems. Taking care of minor problems is always easier than waiting until they become major issues. 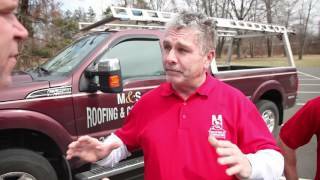 Area roofing experts work with homeowners to keep all roof surfaces leak free.